This stunning 14K white gold dangling heart necklace from Apples of Gold Jewelry combines the favorites of white gold and diamonds, crafted in a sweet heart shape to make your sweetheart swoon! The heart of this necklace, which measures 3/4 inch by 1/2 inch in size, has a surface full of glitzy diamonds - twenty five to be exact! These gorgeous diamonds total 0.125 carats and are rated G-H for color and I1 for clarity. The heart dangles from the chain, giving this necklace a unique and sweet look. 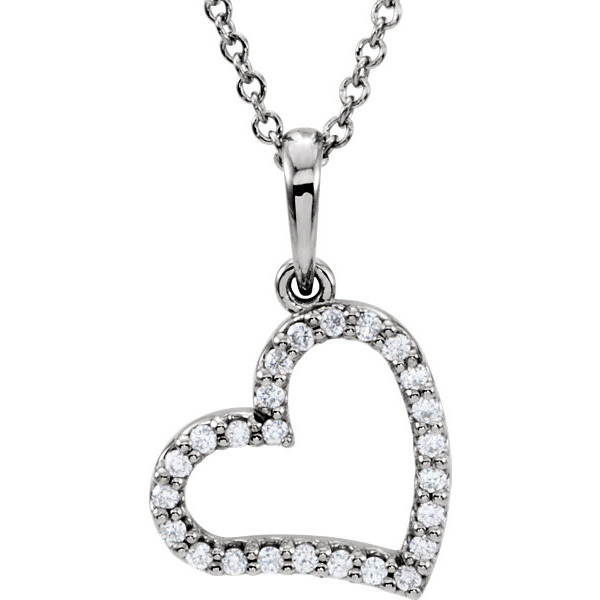 We guarantee our 14K White Gold Dangling Heart Necklace to be high quality, authentic jewelry, as described above.